Welcome to the indoor rock climbing facility at Sunset Athletic Club. Our climbing wall was designed and built by a leader in the industry and offers some of the best climbing routes in the Portland area. Our wall is 35’ wide and 40’ tall and we also have a “bouldering cave”. We have three True-Blue auto-belay systems in addition to ropes for traditional top-rope climbing. Lead climbing is available as well, but you will need to bring your own rope. Our climbing wall offers a great way to cross train your muscles, flex your mind and build your confidence. We welcome beginner and experienced climbers ages 4 and up. Our staff will teach you everything that you need to know to get started. We’re committed to your safety and to providing you with the best climbing environment and programs possible. 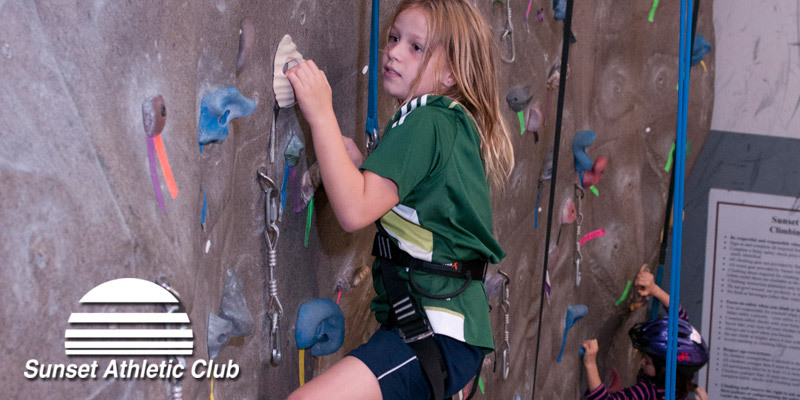 Our climbing facility offers many programs for all ages and abilities. Our “Get Me On The Wall” class will get you started if you have never experienced a rock wall before. If you have climbed before and want more instruction, we offer “Belay Basics”, “Lead Climbing Basics” as well as “Private Instruction”. We offer gear rental and an experienced staff to keep you safe while you have fun. Youth programs include, Birthday Parties, Classes and Camps. Our instructional Clinic on using the Indoor Climbing Wall. Learn the basics and experience the benefits of climbing. In this clinic you will learn about indoor climbing techniques, terminology, and procedures. This class is offered the 1st and 3rd Saturday of each month from 9:00 - 10:00 am. Advanced registration is required. 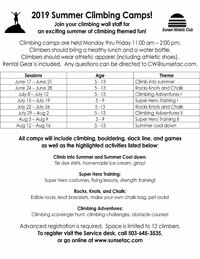 All Summer Camps include lots of climbing, bouldering, slack-line, games and unique theme-specific activities each week. Camps are safe and supervised. Register today, these camps fill up quickly! Climbers should wear athletic apparel (including athletic shoes). Rental gear is included. Bring a healthy lunch & water bottle. Any questions can be directed to CW@sunsetac.com. Please Note: All Participants must have a completed waiver and release of liability on file before participating in an climbing wall event. Payment and Cancellation Policies: Participation in Sunset Athletic Club Climbing Wall programs will be charged to member accounts, unless receipts for other types of payment are presented to Sunset Athletic Club Climbing staff at the start of the programs. Non-members must present receipts of payment at the start of programs. Sunset Athletic Club must be notified of intent to cancel at least 24 hours prior to the start of a program or charges may still apply. SAC Kids climbing classes are open to kids age 5-12. Classes are held the four Sundays of a month from 2:30 - 4:00 pm. Kids will learn climbing terminology, technique and play lots of games! Registration is required and space is limited. Parents/Guardians must sign our Release of Liability Waiver for each participant (see below). In this clinic you will learn basic belay techniques required to belay at the climbing wall. Successful completion of a belay check will allow you to use the ropes in the future. This class is offered the 2nd and 4th Saturday of each month from 9:00 - 10:00 am. In this clinic you will learn the basics of indoor lead climbing. Skills taught include: lead belaying, proper clipping, falling, training techniques, and mental preparation. Please provide your own rope and belay partner. This clinic is scheduled upon request. Climbers must be 18 years old or have permission from parent and guardian. Previous climbing experience and proficiency climbing a 5.9 or higher is required. Rent the climbing wall and enjoy private use of the facility! Rentals are scheduled anytime the climbing wall is free of regularly scheduled programs. Staff supervision and rental gear included. Themed parties, climbing games and other activities are available – Just ask! When is the climbing wall open? Open Climb is scheduled daily. Monday through Friday the climbing wall is open from 5:00-9:00 pm, and from 10:00am-2:00pm on Saturdays and Sundays. What does it cost to climb? There is no fee for Open Climb, but climbing gear is required. If you have your own gear, bring it and there is no cost to participate in Open Climb. If you do not have gear, rent it from us at $5 for shoes and $3 for a harness. How old do climbers need to be? Participants must be at least 4 years old to climb but there is no age limit. There are age restrictions for Open Climb times however. Climbers ages 4 to 7 must have an adult with them in the climbing area. Climbers ages 8 to 11 may stay by themselves, with an adult on the premises. Climbers who are 12 or older may climb by themselves without an adult present. What do I need to know to climb? It is important to learn about the requisite safety measures and the terminology that we use in climbing. A lot of people also want to learn to belay, so that they can use the ropes with a climbing partner. We offer courses on Saturday mornings before Open Climb to teach introductory information, belaying basics, climbing techniques, and more advanced techniques. We also offer privately scheduled instruction for individuals and small groups. 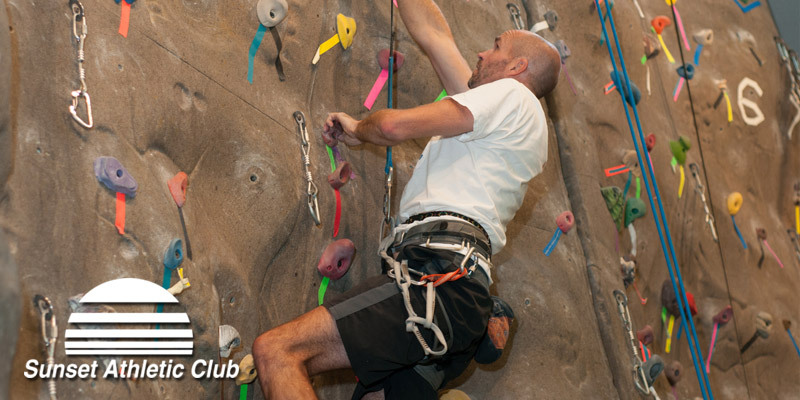 To climb at Sunset Athletic Club, you need to have a climbing harness and climbing shoes. Many people also want to have a chalk bag handy. We rent all of the equipment at the climbing wall, and we also have harnesses and chalk bags for purchase in the Pro Shop. No. We are lucky at Sunset Athletic Club to have auto belay devices that make it unnecessary to have a climbing partner. It can still be a lot of fun, however, to climb with a friend and learn to belay for each other. Can I schedule a special event at the climbing wall? Prior to participation, all participants must complete a Sunset Athletic Club Indoor Rock Climbing Facility Acknowledgment of Risk and Agreement to Participate Waiver and Release of Liability. Parents and guardians are responsible for completing these forms for minors. Participation in Sunset Athletic Club Climbing Wall programs will be charged to member accounts, unless receipts for other types of payment are presented to Sunset Athletic Club Climbing staff at the start of the programs. Non-members must present receipts of payment at the start of programs. Sunset Athletic Club must be notified of intent to cancel at least 24 hours prior to the start of a program or charges may still apply. • Sign-in and complete all required forms before climbing or belaying. • Complete a belay safety check prior to belaying and display your belay card to be easily identified. • All climbing gear not provided by Sunset Athletic Club subject to inspection. • All rental gear provided by Sunset Athletic Club must stay in the climbing area. • Climbing shoes required for climbing as available (when rental shoes are available in the proper size, they must be worn). 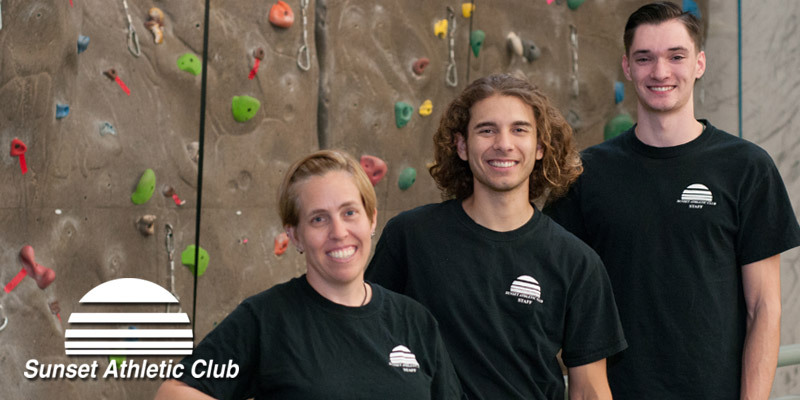 • Climbing instruction permitted only by Sunset Athletic Club climbing staff. • Do not goof around, use profanity or otherwise distract climbers. • No food or beverages (other than water) allowed in the climbing area. • You are responsible for yourself when you climb – make safety a priority – your safety is your responsibility. • Complete safety checks with your belay partner before you climb – every time. • Never take your eyes off your climber when you belay. • When using auto belay devices, always do a safety check with climbing staff and wait to hear “climb on” before climbing. • Always use a spot when you boulder. • Do not climb at heights above 8 feet without a harness and rope. • No children younger than 4 allowed in the climbing area for any reason. • All climbers younger than 8 must be accompanied by an adult in the climbing area. • All climbers younger than 12 must be accompanied by an adult on the Sunset Athletic Club premises. • All participants must be at least 12 to belay for other climbers. • Climbers must be at least 14 to lead climb and lead belay. • Climbers younger than 18 must have parental permission and complete safety checks with climbing staff prior to climbing or belaying. • Climbing staff reserves the right to ask any individual in violation of these policies or compromising the safety of himself or other climbers to vacate the climbing area immediately.